This is my first question for the RV Doctor. I just purchased a replacement powered vent for the bathroom of my rubber roofed Class A motorhome. I’m handy with tools and want to replace it myself. I know there is extra sealant applied around the existing exterior flange. The existing vent is a fan type also, so I won't have to run power. 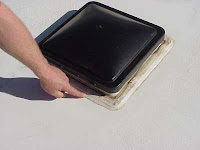 I concerned about the sealant and I sure don't want to damage the rubber roof while trying to get the old vent off. I know I need butyl putty tape and screws. Could you walk me through the procedure? Richard, when working with anything attached to the rubber roof, it’s paramount that the sealant you use be applicable and compatible with EPDM roofing. Any well-stocked RV supply store will have the correct sealant. I do recommend using Eternabond under the flanges of the new vent and on top of the flange to cover the mounting screws. But first, to remove the old vent, you’ll need to dig around each mounting screw to expose the head. Using a reversible drill or screw gun, remove all the mounting screws. You can gain access to the 12-volt wires from inside the RV by removing the garnish trim. You should be able to readily see the electrical connections for the hot and ground wires. After the screws and wires have been removed and disconnected, use a wide blade putty knife to loosen the sealant under the flange of the vent assembly. Carefully cut through the sealant and remove the vent assembly. Take care not to tear into the rubber membrane itself. Clean off all residue of the old sealant and apply the Eternabond tape directly to the underneath portions of the new vent flange. The 14-inch opening in the roof should be just right for any aftermarket vent unless the old vent had radiused corners. If so, it will be necessary to cut each corner square with a jig saw. After securing the new vent, use Eternabond tape to seal around the screw heads and the edges of the new vent. Inside, simply hook up the wires as they were on the old vent, reinstall the garnish trim and you’re set. Remember, not all roof sealants are compatible with EPDM rubber roofing so it’s important to use the correct type of caulk.